Embarkation time for our ship in Cannes was 5:00 PM, so we had some time to kill. We had petit déjuner in town and spent some time at the small weekly farmers market. We also walked over to the Port de la Darse, where galleys were once built and pleasure boats are berthed today. 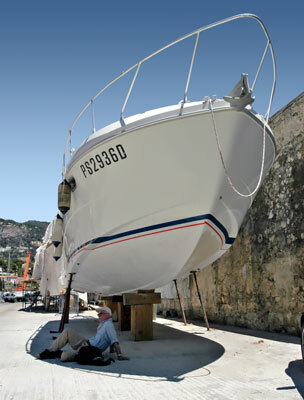 It also provides dry-dock facilities for repairs. Finally, it was on to the railroad station where we waited over an hour before the train arrived. In Cannes, we taxied to the Quai Laubeuf, registered at the Star Clipper's welcome tent, and took a tender to the ship. Once settled into our cabin, we reacquainted ourselves with the ship that had provided so much pleasure in 2001. At 10:00 PM, the Star Clipper hoisted anchor and sailed into the Mediterranean to the familiar strains of the "1492 Overture" (theme from the movie 1492).